In today’s fast moving world, it is vital for all businesses to be able to operate at every possible moment. The inability to “work” could be catastrophic for your business. 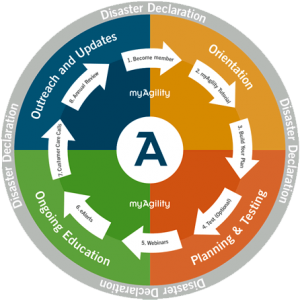 For over 20 years, Agility Recovery Solutions has been enhancing business continuity plans by providing disaster recovery services for four key situations that could be crippling to your business – loss of: power, technology, connectivity, or use of your space. Understanding the importance of having continual availability to our clients, the Toole Agency has been a member of Agility since 2006. The first step of your partnership with Agility would be the identification of your needs (i.e. trailers, servers, computers, work stations, satellite dish, etc. ), should you lose power, technology, connectivity or your work space. Once this is determined, you would then be able to decide which one of Agility’s “ReadySuite” monthly plans is best suited for your needs. Quick Ship – desktop PC’s, Intel servers, Unix platforms, networking devices shipped to recovery site. Satellite – installation of satellite dish with required cabling, routers, modems, etc. The main variation between the suites is the number of workstations and servers provided. While Agility provides the above, you would need to provide the recovery site, any required fuel, waste disposal, permits, security, and IT support for recovery of your application systems and network infrastructure. As well, they can provide testing to satisfy requirements of regulators and your own risk managers. Depending on the “ReadySuite” elected, this may be done for no additional charge. Let’s face it, no one really expects to encounter situations that will halt their operations because “It always happens to the other guy.” So it is natural to want to avoid the costs associated in proactively partnering with a company like Agility. would you experience an increase in disgruntled employees, payroll, down time, frustrated customers; and loss of immediate and/or future revenue? would your business survive in the event of a disaster? Most business owners hold the viewpoint that the cost associated with their Agility “ReadySuite” is really an investment in the financial stability of their company. The peace of mind that can come from partnering with Agility Recovery Solutions is priceless.